Many people believe they simply aren't good at math-that their brains aren't wired to think mathematically. But just as there are multiple paths to mastering the arts and humanities, there are also alternate approaches to understanding mathematics. One of the most effective methods by far is visualization. If a picture speaks a thousand words, then in mathematics a picture can spawn a thousand ideas. The Power of Mathematical Visualization teaches you these vital problem-solving skills in a math course unlike any you've ever taken. Taught by award-winning Professor James S. Tanton of the Mathematical Association of America (MAA), these 24 half-hour lectures cover topics in arithmetic, algebra, geometry, number theory, probability, statistics, topology, and other fields-all united by fascinating connections that you literally see in graphics and projects designed by Professor Tanton. In demand worldwide for his teacher and student workshops, Dr. Tanton is MAA's Mathematician-at-Large-a globe-trotting advocate for teaching math "with beauty and joy and wonder and humanness," as he was recently quoted in The New Yorker magazine. Long division: Elementary school students typically learn a traditional method of long division that works but can seem abstract. By contrast, the dots-and-boxes approach is more intuitive and actually explains why the traditional method works. Binary arithmetic: The binary base system uses only 1's and 0's, which is how computers calculate with on/off switches. The game of dots-and-boxes makes arithmetic in binary and any other base system child's play-even for fractional bases. Polynomials: The study of polynomials in algebra is, astoundingly, mostly a repeat of grade-school arithmetic, done in base x rather than base 10. Dots-and-boxes comes to the rescue for intimidating-looking polynomial problems, and even for dividing polynomials. And that's just the beginning. Once your mind is attuned to think about mathematical relationships in terms of visual models such as dots-and-boxes, the insights start to pile up. That's when you are truly doing mathematics-not just mechanically following an algorithm or formula you memorized in school. Visual thinking lets you see the logical steps that lead to an answer and grasp the solution that must be true. Throughout the course, Dr. Tanton often adjourns to his tabletop lab to illustrate mathematical ideas with activities that you can try at home, involving poker chips, marbles, strips of paper, and other props. Some seem positively magical, like the miraculous division of a pile of jelly beans in the last lecture, where your method is inspired by a simple folding pattern. parents, who can best help their children with math homework by fostering a playful, enquiring attitude-just like Dr. Tanton's. You start the course with pictures that go with grade-school arithmetic. As you study them, you see how they are springboards to more advanced ideas. For instance, visual thinking about multiplication can make perfect sense of why negative times negative is positive. Then you venture deeper, seeing how pictures that help you keep track of combinations of objects lead to Pascal's triangle and from there to the concept of structure in randomness. And simple exercises in folding paper end up with exquisite fractal images and the consideration of a truly astronomical problem. Next, the famous Fibonacci numbers come into focus thanks to a visual model that is a well-kept secret. You also learn how symmetry can save the day with quadratic equations. You play with balance points in statistics and the idea of a fixed point in a stirred cup of coffee. And there's more! Make it happen: "If there's something in life you want," he says more than once, "then make it happen!" If an additional five on the left side of an equation makes the calculation easier, just tack it on-along with five on the right side to keep things balanced. Take an easier way out: Instead of learning formulas and procedures by rote, simply follow your nose and common sense. Once you discover the deeper reason for a rule, such as the quadratic formula in algebra, then you won't need to memorize anything. Don't stop: Nothing in mathematics leads to just one place. Think of a mathematical picture as a doorway to many destinations. One of the big lessons from this course is that an image can be interpreted in multiple ways, which is a powerful technique in mathematics. Mull it over: When perplexed, don't be intimidated. Do a lot of staring and mulling. Play with the problem. Then take a break. Go for a walk. More often than not, your brain will surprise you! This is actually a good approach to many of life's muddles. Mulling comes naturally to Professor Tanton. As a research mathematician, he can't help sharing a recent discovery he made by contemplating a simple diagram related to the Fibonacci series, turning it over and over in his mind. In Lecture 18, he walks you through the result, which is the world premiere of a brand new theorem. He discusses it exactly as he would with his colleagues over dinner-with barely contained excitement that you will find infectious. 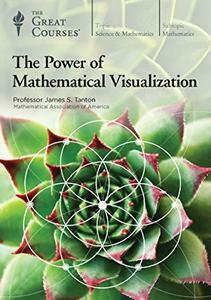 The Power of Mathematical Visualization [HD] rapidshare mediafire megaupload hotfile download, The Power of Mathematical Visualization [HD] torrent emule download, The Power of Mathematical Visualization [HD] full free download, The Power of Mathematical Visualization [HD] rar zip password or anything related.